We invite you to enjoy a personally guided walk around our farm and hydro plant. We will describe in detail the design, construction and operation of Old Walls Hydro, and how it turns the power of falling water into electrical energy. We call it the “water to wire” walk. You will also learn about our farming activities and the beautiful, unique environment you are walking through, plus a little of our family’s history at Old Walls. Walks take about two hours, sometimes more for larger groups. The whole hydro plant is viewed, from water intake to tailrace. We try to give you as much information as we can and welcome questions at any time. Walking boots or wellies are highly recommended. Under our Higher Level Stewardship (HLS) scheme we have a quota of 25 free walks per year for groups of 6–30 people. This is our tenth and final year of free HLS walks. Our funding finishes on 31st December, so please book now to ensure you don’t miss this opportunity! Once our annual free walks quota has been used, walks will cost £100+VAT for up to 30 people. Walks can be booked on any day of the week – mornings, afternoons or evenings. Please contact us to book or check availability. We are accessible by car, minibus and coach. Please see our directions and interactive map. 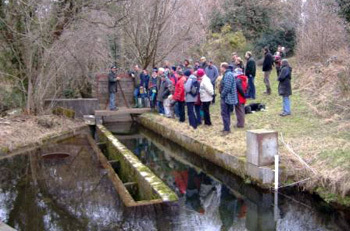 We welcome any interested group at Old Walls Hydro and can come to you to do our presentations. For an off-site presentation, all we need from you is electricity (preferably from a green source!) and a bit of space to set up. 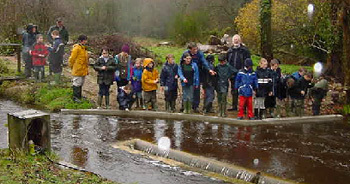 Schools and other educational groups come to Old Walls Hydro to see the system in operation and learn about hydro power. Our system is relevant to many curriculum subjects from early primary right through to university courses such as science, geography, environmental art, rural studies and sustainable development. Presentations can also be given on or off site to increase understanding and give a better oversight of how the scheme was developed into what we see today. We feel that combining a walk and a talk is the best way to fully understand the processes we have gone through to create the micro-hydro system and appreciate how renewable energy is generated from the power of water. We often split this over two days, with a presentation, followed by a visit the next day. Information is displayed through annotated diagrams throughout the scheme to provide further details and explain what you are looking at. Interactive models and displays are also available for hands-on learning. We have our own risk assessment and always have at least two guides with any school party in addition to school staff.